Today much preaching and teaching throws people back upon themselves to earn their relationship with God and to try to achieve by their own efforts the kind of person that they ought to be. 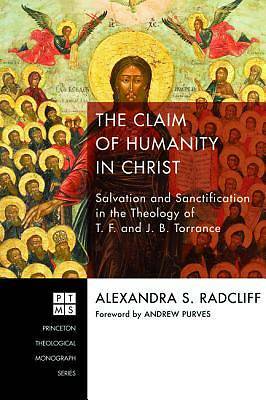 In The Claim of Humanity in Christ, Alexandra Radcliff counters the Torrances' critics to show the significance of their controversial understanding of salvation for the interface between systematic and pastoral theology. Radcliff then constructively extends the implications of the Torrances' work to a liberating doctrine of sanctification. The Christian life is conceived as the free and joyful gift of sharing by the Spirit in the Son's intimate communion with the Father whereby we are turned out of ourselves to reflect the reality of who we are in Christ. ""Alexandra Radcliff's impressive study of the theology of Thomas F. Torrance and James B. Torrance explores what the experience of salvation might look like for Christians when it is not viewed from within a legalistic or contractual view of divine and human relations. This is one of those rare studies that consistently demonstrates why any view of conditional salvation obscures the true force of the gospel. Such a view puts an undue burden (the burden of the law) on people who should recognize that they have been made free to live joyously as those whose humanity has been transformed in the life, death, resurrection, and ascension of Jesus Christ himself. This is an important work that helpfully opens new vistas for readers who will see the implications of a proper understanding of justification and sanctification for the Christian life."" --Prof. Paul D. Molnar ""The Scottish theologian Thomas F. Torrance (1913-2007) is reckoned to be one of the leading Christian thinkers of the twentieth century. But many find his work difficult to read. Dr. Alexandra Radcliff, working with the advice and guidance of Torrance's nephew, Alan Torrance, has produced a highly readable account that relates the theology of Torrance and his brother, James Torrance, to the life of the Church and the believer. She brings the Torrances' Christ-centered, Trinitarian theology to bear on contemporary spiritual life and renewal."" --Prof. Thomas A. Noble ""Alexandra Radcliff is a Torrance scholar, newly minted. Her book is both a careful presentation of Torrance theology (Thomas, James, and David) and a gentle critique of its reluctance to push more firmly into the nature of sanctification. As such, she makes a timely, significant, and helpful contribution to Torrance studies. The book is beautifully written and superbly organized, and should be accessible to readers who have struggled with 'TF's' language especially."" --Prof. Andrew Purves ""An incisive, scholarly, and lucid exploration of the Torrances' thinking on salvation and sanctification and so much more Few theological books shed so much light on the practical relevance of the Gospel for the mission of the church. This clearly written volume is for scholars, students, and thinking evangelicals alike."" --Prof. Alan J Torrance, University of St. Andrews Alexandra S. Radcliff earned her doctorate in theology as the Donald M. Baillie Scholar at the University of St. Andrews. She is assistant editor of Participatio and works at the Stony Brook School in New York.